I may sell off my stock 16" wheels on my Tacoma and go to 17". Probably won't happen after the winter season, but just doing some research. I'd like to go steel and around 4.5" backspacing. 17" rims, and will go 255/75/17 BFG KO2's. Only results coming up are a couple of Procomps. Any others I should consider? I hate the Rockstar or whatever, fake bead lock, diamond studded, etc. wheels. Just want something basic, like below. For 17" wheels you could run stock FJ Cruiser spares or 1st gen Tundra wheels. Although I'm not 100% sure 1st gen Tundra had 17" steels now that I think about it. They had 6 lug wheels, though. Either way 17" spares from FJCs would work. but with more backspacing than you're after. I used to run simple black steel rims for years until rust became an issue and on my new truck I went with aftermarket aluminum rims. I used to order my black steel rims from national tire and wheel and desert rat. I cant remember the brand but check with those two companies. Cragar has soft 8's that're pretty affordable through Summit Racing. I think they have the d style too like the picture you posted. 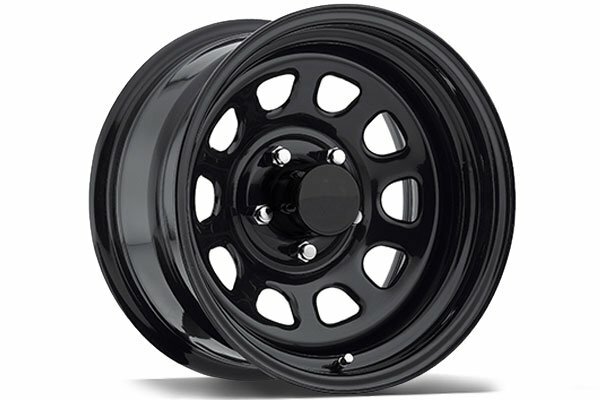 If you're just looking for a simple black wheel but aren't set on keeping it steel, American Racing has the AR923 and AR172 that're pretty popular styles in alloy. Also just an reminder, your wheel width will determine how far inboard or outboard it sits as well, not just your backspacing. So for example: A 9" wide wheel with 4.5" backspacing will be centered at it's mounting surface. An 8" wide wheel with 4.5" backspacing will be mounted slightly outboard of center and be slightly more sucked in towards the frame. Thanks for the suggestions. I thought of the FJ rims. But if I ran those, I'd probably get spacers, which I really don't want to do. If you want something basic and affordable, consider the rim that's probably hanging under your truck bed on your spare tire. They aren't 17s, but they accommodate my BFG 255/85/16 Muds quite nicely. That's a tall, "skinny" tire, about an inch taller than what you indicated you might be after, but the same width. The rims are $105 each, from Olathe Toyota, Toyota PN 42601-AD030. I've had mine on for three years and they look like new once they're cleaned up. I should do this same thing to my 2011 standard cab. Yours looks really good, steelies just have that perfect look to me.